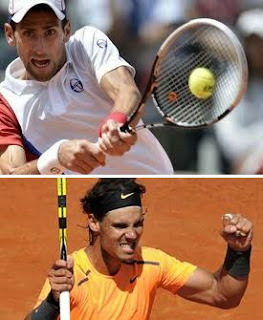 So it is all set for the clash of the titans - World No.1 Serbian Djokovic playing against second seeded World no.3 Spaniard defending champion Rafael Nadal in the history making final of Roland Garros, Sunday 10 June, 2012. For Nadal, it is a history making match as no one has ever before won the French Open seven times. For the Serb, it is again a history making event as a win against Nadal will allow him to have four Grand Slam titles at the same time - and become the third man in the history of tennis to hold all gour rand Slams at one time. The record was last set in 1969 by Rod Laver. In his semi final against Roger Federer, the Serb did not seem to have any difficulty Friday in over powering World no.2 Swiss Roger Federer and ensure his ouster from Paris 6-4, 7-5 and 6-3. Federer, who had already predicted that it would be Nadal again this year to hold the Roland Garros title silverware moved out to pave way for the Spaniard. Nadal and Djokovic have along career list of duels since they first met in French Open quarters in 2006, which was won over by Nadal as the Serb retired after losing two sets 6-4, 6-4. The match is scheduled on Sunday 10 June 2012 at 13:00 GMT on Court Philippe Chatrier.